“No matter the language, distance, race or religion, when women’s hands are united in a single cause, the impact will radiate beyond the heart. Women technologists, transforming communities and lives. Technology is a tool that has advanced on a large scale, which allows us to be connected with many people from around the world. It helps us to motivate others to join the fight for women’s rights. 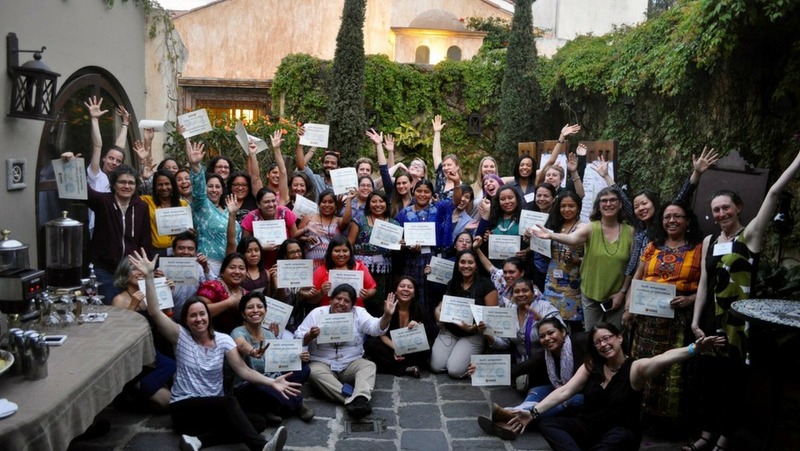 Across Latin America, women leaders and their allies are combating violence against women. They are improving women’s and girls’ access to education and healthcare and political and economic inclusion. At WAKE, we believe deeply that an influx of tech training, tools and resources will expand the reach, depth of influence and potential for impact for the women’s rights movement. As we looked to expand our Tech2Empower initiative to Latin America, we found the perfect partner in the Inter-American Foundation (IAF). We were immediately impressed by the IAF’s dedication to its grantee partner community and the ways in which it invests in the inspiring people that run these grantee organizations. Working together with the IAF, we designed Tech2Empower Guatemala to get tech tools, training and resources to IAF grantee partners throughout the region. Last spring, we gathered in Antigua, Guatemala with a dedicated group of women and men to learn from and with each other. Collectively we had traveled many miles coming from Costa Rica, Dominican Republic, Honduras, Mexico, Nicaragua, Peru, all over Guatemala, and as far as California. Our desire to learn, share and leverage technology and communications tools and skills to advance women’s rights united us. The Latin American leaders took time away from their hectic lives and the important programs they run because they wanted to gain access to new methods of reaching their communities, expanding the power of their storytelling for effective fundraising, and operating their organizations safely and efficiently. The workshop participants enthusiastically dug into topics such as digital strategy, Google collaboration tools, online safety and security and graphic design. Through interactive sessions they began using their new skills immediately, which sparked ideas for how to use these tools upon returning home as well as how to train more colleagues and community members to spread the lessons learned. Google Forms will be very useful since it is sometimes necessary to collect information for statistics. They help us communicate with our users and expand the network of volunteers. The work is done in a more efficient way, and we can make folders. It also helps us to get in touch with new donors. They help us make the work more efficient, for example using Google Sheets helps us that the work we develop, can be more understood by the users, when we use fixed views. — Centro de Servicios Legales para la Mujer (CENSEL), IAF grantee partner from the Dominican Republic. Connecting women across borders and across industry creates powerful change. Often women with limited experience feel intimidated by tech and as a result miss out on tools that can catapult their work to new levels. Through Tech2Empower we create a very safe and supportive space in which the nonprofit leaders both deepen their knowledge and, just as importantly, increase their comfort level and sense of empowerment and leadership. We believe that women in the tech industry have a tremendous amount to offer and also that it’s critical for them to learn about the diverse end-users of products they are designing. Eleven women representing companies such as Google, Mozilla and Salesforce joined us in Guatemala and volunteered to lead training sessions during the Tech2Empower workshop. Beyond the formal part of the workshop, the American volunteers got to know the Latin American leaders by working with them in small groups, sharing meals and dancing together. In a post-workshop survey, 100 percent of these women said the experience provided them with new perspectives that will influence their work and personal lives. Tech2Empower was truly a two-way cultural and learning exchange and the launch of a network that will support its members for a long time to come. In addition to the knowledge we gained in this workshop, it was very rewarding to share and connect with other organizations. I learned a lot from indigenous colleagues who attended and also appreciated the sense of community and closeness with everyone there sharing and learning together. I learned a lot at all levels not only technical skills! Demonstrating once again its dedication to long-term impact and meaningful support to its grantee partners, the IAF continues to partner with WAKE, making it possible for us to provide three months’ worth of follow-up training to the Tech2Empower participants. We are midway through, with weekly webinars that go deeper into the topics covered in Antigua as well as introducing new topics such as “YouTube Video Creation + Distribution” and “Team Collaboration with Slack.” We are excited to see the videos, the beautiful newsletters, the enhanced websites and the powerful advocacy campaigns that come out of the creative and tech-savvy work underway by Tech2Empower participants. * Trish Tierney is co-founder and CEO of WAKE International, an NGO that seeks to amplify the work of women leading change globally. It connects them to new networks, tools, training and resources. For more on their work visit www.wakeinternational.org.